Laminated card containing Arabic poetry, phrases, as well as a small leaf. While walking through the traditional market we noticed a table full of various types of amulets (jimat) for sale. One was a laminated card, which had both sides printed in Arabic text. People will place these cards in their wallets, purses, cars, motorcycles, etc., to ward off evil spirits and bring good luck. Since the Quran was written in Arabic, Muslims consider the Arabic language a sacred and holy language. For that reason there is tremendous respect and honor given to it, above all other languages. This replica of an old Dutch coin is carried by Indonesians, or placed above doorways, to protect them from evil spirits and give good luck. While visiting a traditional market, we stopped at a stall that was selling a variety of amulets, one of which was an assortment of replicas of old Dutch coins. 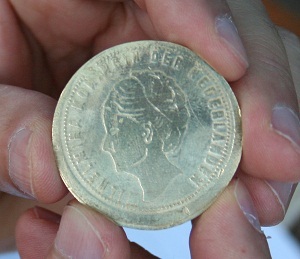 There are many Indonesians which believe that old coins and old paper currency possess magical powers. People will carry this money in their wallet for protection. We’ve also known people to place them above the doors to their homes, on a ledge in that area. This is somewhat similar to the horseshoe that people in US used in days gone by. These horseshoes are still commonly seen hanging above barn doors, though the people only have them there as a decoration, they don’t really place any value in them.